Asian Music Blog recommendation for this week is Stylish Nonsense. 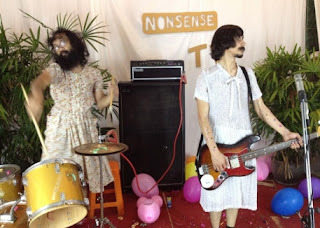 Stylish Nonsense is duo from Thailand. Wannarit “Pok” Pongprayoon and Yuttana "June" Kalambaheti are considered the leader of Thailand's electronic movement. It's easy not to take them seriously because watching them makes you feel like you are watching... well... nonsense... or two guys that are high on drugs. BUT if you listen to their records and listen to the words, you'd realize that they do make a lot of sense. They deliver it in an unconventional manner but there's a lot of seriousness and pensiveness behind the insanity. Don't forget to go to Amazon to check out the music of Stylish Nonsense and other Asian Music Blog Recommendations. As mentioned, their sound is primarily classified as electronic but Pok claims it's not intentional. They really don't give a fine fudge what people call their sound. They are just here to make music. They ended up sounding electronic and experimental because they didn't have a drummer. They were forced to use the computer as a "third bandmate". Before they knew it, they were being called electronic. Many Asian music blogs also notice that their live performances also don't sound like their their recorded songs. They say this is intentional. They don't like repeating what their record sounds like. If they will just do what they did on their records, people might as well listen to their CDs. In fact, they don't rehearse before their show. They don't even talk with each other. They just go on stage and play. They are known for using vintage and weird instruments but they claim these are not planned. They just ended up with those instruments because they felt like using it. This unpredictability made it difficult for them to get a record deal. That's why Pok put up Panda Records. No one would give them a break so he created a label that would support themselves. It hasn't been easy but more and more people are recognizing them. Pop stars are also covering their songs. It amuses Pok because they 'can't even play their own songs'. More importantly, it is Stylish Nonsense that's opening the ears of pop music lovers to electronic and experimental music. As they get more invitations to play on TV and bigger music events, the public is slowly growing their ability to appreciate the sound.